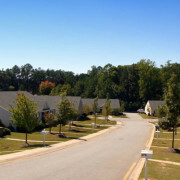 Luxury student living in Clemson has culminated in the University Cottages at Ingles Crossing. These beautiful, spacious townhouses and cottages offer residents the latest in not only comfort and amenities, but safety as well. The well-lit grounds of Ingles Crossing present a multitude of options for outdoor enjoyment, including grilling areas, fire pits, dog park, and a pool–complete with tanning deck and waterfall. The clubhouse not only provides a place to congregate, but also a meeting room and fitness center. Each residence boasts sleek black appliances, maple cabinets, and granite countertops, with easy-to-clean LVT flooring throughout the common areas. A washer and dryer is included in every unit. Ingles Crossing has taken advantage of the latest technology, offering residents free Wifi and Bluetooth Smart Locks, providing peace of mind for students and parents alike. On-site management further insures that safety is a top priority at Ingles Crossing. Conveniently located 2.5 miles from campus on HWY 93, Ingles Crossing is on the CAT Bus route and offers easy access to shopping, dining, and campus. Rates start at $595 per bed.